Why are zombies consuming the popular imagination? This book – part social analysis, part theological critique and part devotional – considers how the zombie can be a way to critically situate our culture, awash with consumer products. The book considers how zombies are the endpoint of social theory’s exploration of consumer culture and its postsecular turn towards an earthly immortality, enacted on the flesh of consumers. 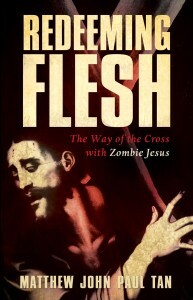 The book also shows how zombies aid our appreciation of Christ’s saving work. Through the lens of theology and the prayer of the Stations of the Cross, the book incorporates social theory’s insights on the zombie concerning postmodern culture’s yearning for things beyond the flesh and also reveals some of social theory’s blindspots. Turning to the Eucharistic flesh of Christ, the book calls out on the zombie’s secularized narrative of salvation of the flesh, one where flesh saved by being consumed and made to die. By contrast, Jesus saves by enacting an alternative logic of flesh, one that redeems the zombie’s obsession with flesh by Eucharistically giving it away. In doing so, Jesus saves by assuming the condition of the zombie, redirecting our logic of consumption and fulfilling our yearning for immortality. Does social justice promote Christian unity? 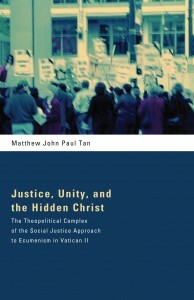 With reference to paragraph 12 of Unitatis Redintegratio—Vatican II’s declaration on ecumenism—this book argues that an emphasis on justice and unity without proper consideration of social context actually risks obscuring a clear public declaration of Christ, by having Christians uncritically accept the presumptions that underpin the sociopolitical status quo. This constitutes a failure in Christian interpretation, the crux of which is a failure in ecclesiology. Tan suggests a corrective with reference to works by Pope Benedict XVI, theologians such as Graham Ward, and postmodern theorists like Michel Foucault. Ultimately, the book invites the reader to begin considering how answering this seemingly simple question will implicate not only theology, but also philosophy and political theory, as well as considering the need for the church to engage in a bolder confessional politics in place of the politics of the public square often favored by Christian and non-Christian commentators. The book has been endorsed by Prof. Tracey Rowland of the John Paul II Institute for Marriage and Family, as well as Dr. Benjamin Myers of Charles Sturt University. Click here for a review of the book, here for a free sample chapter, and here to purchase a full copy.